In 1931, the French cavalry arm needed a fast vehicle for advanced reconnaissance missions in enemy lines. Renault, eager to be ready for the upcoming specifications, quickly devised a very small and light vehicle in November 1931. This first Tracteur léger de cavalerie type VM was equipped with Carden-Loyd suspensions (purely copied, but without licence), was lightly armored and equipped with only a single machine-gun. 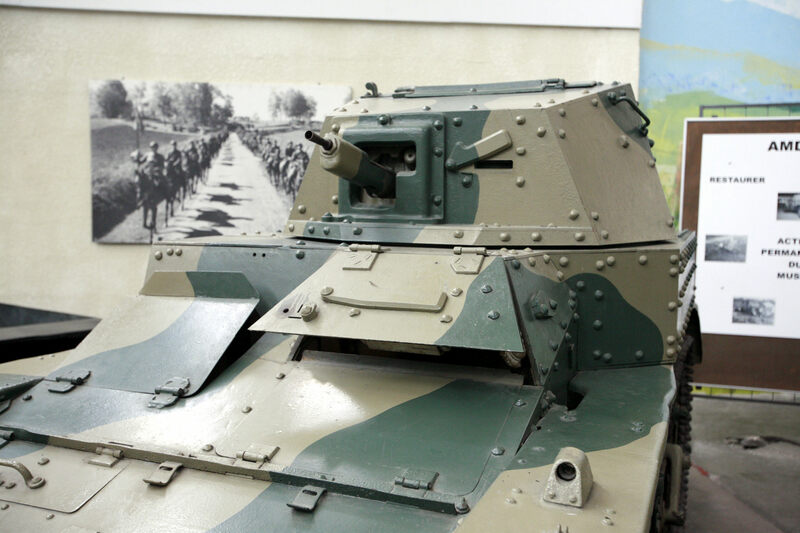 By January 16, 1932, the specifications came in, calling for a three-ton light reconnaissance tracked vehicle armed with a machine gun and a range of 200 km (124.27 mi), to be called “Automitrailleuse de Reconnaissance”, abbreviated AMR, since the Cavalry was forbidden by law from using tanks. For the army this was a skirmishing, radio-less vehicle rather than a pure recon vehicle, like the AMDs (Automitrailleuse de Découverte). Renault had completed its prototype in the meantime, based on the Renault UE and showing impressive performances. It had excellent off-road capabilities and could cruise at 50 km/h (31 mph) and up to 35-40 km/h (21.74-24.85 mph) on bad terrain. But it was rejected as too cramped for operational use. Ten days later, officers from the Section Technique de la Cavalerie approached them for designing a tankette of the AMR concept, which was later lobbied for at the General HQ commander, General Maxime Weygand, whom eventually agreed on the type. Renault then quickly returned to the drawing board and presented a larger, wooden mock-up in March 1932. On April 20 an order for 5 prototypes was signed, with a deadline, the Champagne maneuvers in September 1933. Each of the prototypes was delivered on schedule, testing different suspensions configurations, all based on the Carden-Loyd type. These were equipped with one of Renault’s most powerful, already available commercial engine, the 6-cylinder Reinastella, also used on the luxury sedan of the same name. 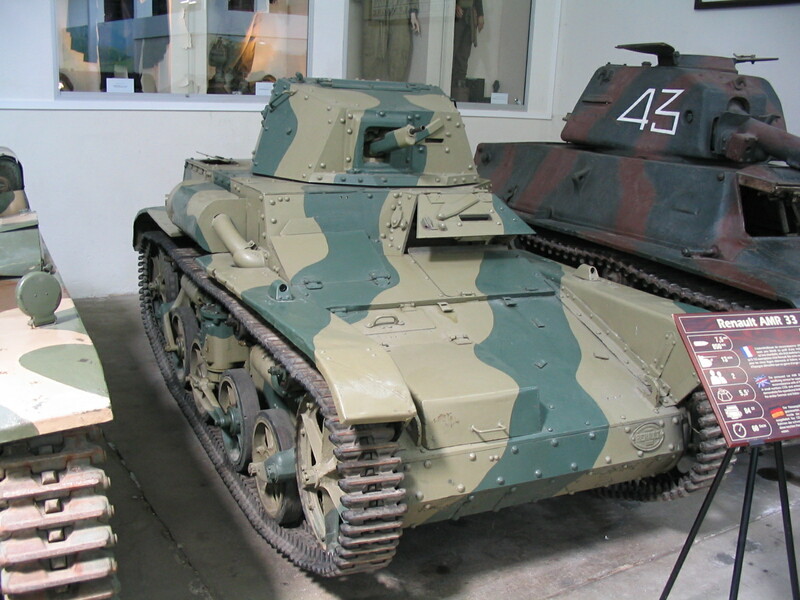 By its weight and dimensions, the AMR 33 was first considered a light tank, not a tankette, but that was before the appearance of the much heavier Hotchkiss H35, Renault R35 and FCM 36. By all standards, they had tankette characteristics. First of all, they were small and very low and their suspension was largely inspired by the Carden-Loyd design. The empty hull weighed just 4.5 tons, the armor was only 13 mm (0.51 in) thick and was made of riveted plates which supposedly protected the crew from heavy machine guns and the engine fitted eventually was another commercial model, the eight-cylinder 84 hp 4241 cc Renault Nervasport, fitted on Renault’s only sports car (or GT in modern terms). This was a nervous engine which, combined with the lightweight hull, allowed for speeds in excess of 60 km/h (37 mph) on flat ground, and 47 km/h (28 mph) off-road. There was a Cleveland differential and a 4 forward, 1 reverse gearbox. The main fuel tank contained 128 liters (33.81 gal), giving a 225 km (139 mi) range. The tracks were narrow, as customary for tankettes, at just 22 cm (8.66 in) width. 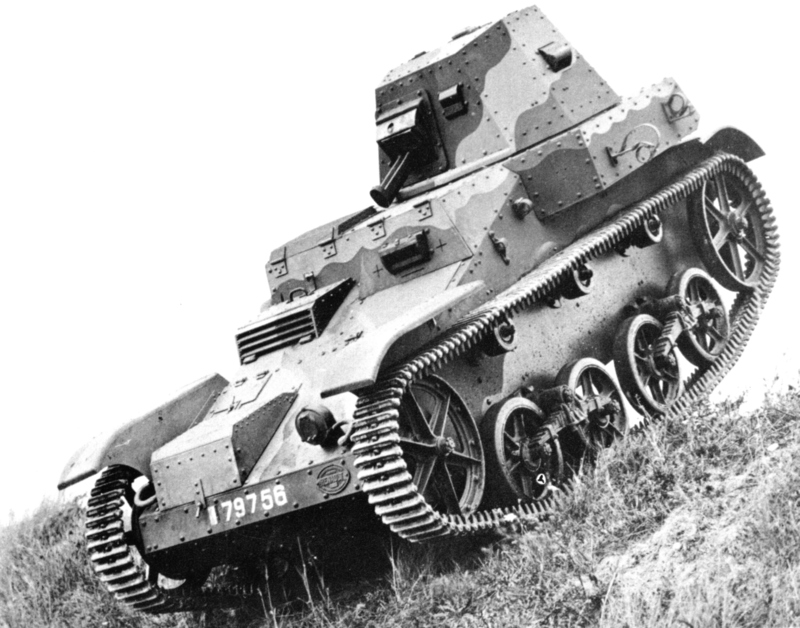 The AMR 33 could ford 60 cm (1.96 ft) deep rivers, cross 1.4 m (4.59 ft) wide trenches, climb a 45 cm (1.47 ft) high obstacle or a 50° slope. The armor was well sloped at the front glacis (9 mm/0.35 in), 13 mm (0.51 in) thick on the vertical plates, 6 mm (0.23) on the top and 5 mm (0.19 in) on the bottom. The driver sat on the left, next to the engine, seeing through a large opening protected by a lifting hatch, pierced by a vision slit. The engine could be accessed through a hatch on the right, and crew entered the vehicle through the rear two-piece door. The turret was also on the left, with the commander inside, provided with a top observation hatch (and not a rear hatch as customary on French tanks). The turret was of the Renault type. Initially a Schneider cast one was preferred, but found too expensive. The Renault type, made of sloped riveted plates was lighter and easy to built. This AVIS turret had been designed by the Atelier de Vincennes and shifted slightly to the front to improve visibility. The compact Reibel 7.5 mm (0.29 in) machine-gun was a fortress model, comparable to the British-Czech Besa. There was however an optional pedestal mount, adjusted on top of the turret for an extra AA machine gun. The Renault prototypes were tested in real, large scale exercises with the first operational French cavalry unit, the Détachement Mécanique de Sûreté. However, the Commission de Vincennes, charged with testing them, although finding their speed sufficient, did not think so about their weight and range. There was an obvious contradiction there which was quickly revised, the allotted weight moving from 3 to 4.8 tons, which permitted Renault to reinforce the hull and fix larger tanks to meet the range specs. In April 1933, new tests were performed with two tankettes fitted with a dead weight mimicking the extra armor. One had a horizontal rubber spring suspension, the other a central vertical spring and casings of the horizontal springs oil-filled to act as dampers. 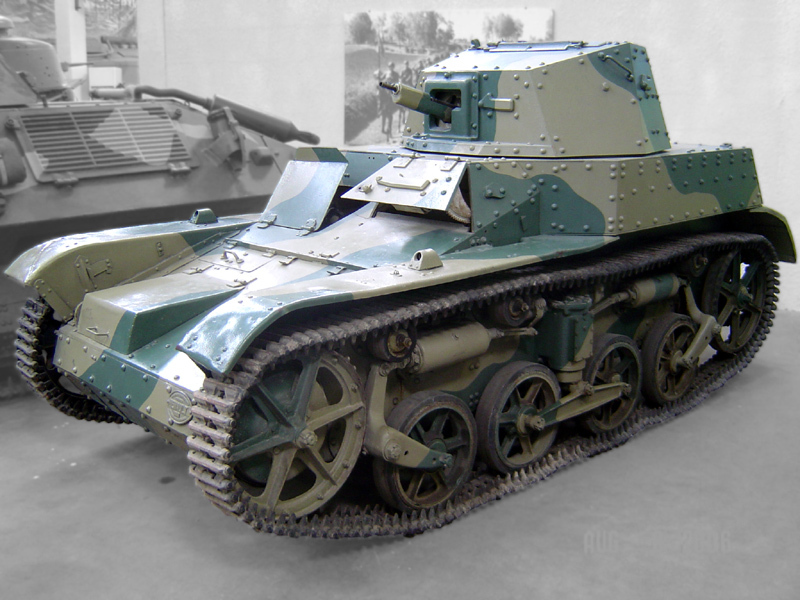 Renault preferred the first, but the Army chose the second (with dire consequences), which was approved for production the 6th of June as the Renault AMR modèle 1933. Factory designation was VN. The first order of 45 units was issued by the Cavalry corp as soon as March 1933. A second of twenty was passed on June 22, deliveries being very tightly scheduled for July. Finally, a third order for fifty came in August. However, production proved difficult at first and finally the deliveries began in June 1934 and ended in September. Two machines were completely rebuilt to produce a new improved model, the AMR 35. To compensate, three others were built in the spring of 1935. Indeed the flaws quickly detected on the model 33 put an end to further developments. The AMR 35 was much more successful. The first problem was excessive vibrations and noise caused by the engine. Compartmentalization was poor and there was no intercom nor radio. But, moreover, the suspensions, initially designed for far lighter models, proved far too too weak for the task, broke down, broke off, or literally fell to pieces in prolonged off-road rides. In the beginning, their operational concept called for a mass of light tanks preceding the medium types, but, since in the meantime mediums were produced in sufficient numbers, the AMR 33s saw themselves quickly replaced by the AMR 35, their role shifted towards infantry and dismounted cavalry support. By 1934, 115 vehicles had been delivered, and spread among five cavalry divisions, in GAM (Groupe d’Automitrailleuses) units comprising three platoons of four, two reserve/training, and one command model. However, the 5th DC received only ten and the 4th DC forty. It was composed then of the 4th BPC (Bataillon de Dragons Portés) and 18e Dragons. By 1935, the 4e DC was converted into a fully armored division, at first with six full squadrons of AMR 33s and later reinforced with medium tanks. At the end, the 1 DLM and 2 DLM (Division légères Mécaniques) formed the core of these new divisions in case of war. However, by 1937, the mechanical unreliability of the AMR 33 was notorious and all had been replaced by the AMR 35. The AMR 33s were concentrated in remaining RAMs (Régiment d’Automitailleuses) forming light divisions of 46 vehicles. However, these were reorganized once again between September 1939 and May 1940 into five newly-formed Divisions Légères de Cavalerie (“Light Cavalry Divisions”). Their organic strength was still poor, ranging from 26 to 22 per DLC, and this was proven during the battle of France. They had been posted in the Ardennes sector and found themselves badly prepared to stop the German advance, only participating in skirmishes, covering actions and support actions for the infantry, but proved easy prey for the Panzer II and many armored cars equipped with the same 20 mm (0.78 in) gun. The losses were appalling. An AMR 33 of the 3rd DLC was the first French tank destroyed in battle, but most of the 75% losses occurred due to breakdowns rather than enemy fire. On June 7, 1940, the 7e DLM was created of surviving vehicles and some reserves, having 14 AMRs in total. Most were lost. After the armistice, the Germans captured a handful of these models, renamed Panzerspähwagen VM 701 (f). They never left French soil and were probably kept for patrolling and anti-partisan activity. A single AMR 33 has survived to this day. It is on static display at the Saumur tank museum in France. Prototype, with the early type turret, Champagne maneuvers, autumn 1933. AMR 33 from the 4th BCL, January 1939. AMR 33 from the 3rd DLC, Ardennes sector, 11-12 May 1940. AMR 33 from the 7th DLM, June 1940. AMR 33 On static display at the Saumur Museum. The driver and engine hatches are open, and the sloped glacis reminds its filiation with the Renault UE tankette family.